Platonite range set by Hazel Atlas Glass Co. - Photo courtesy of Morphy Auctions. Although it is sometimes referenced as milk glass erroneously by novice collectors, Platonite is reported to be the only color of glass ever patented by any glassware manufacturer. 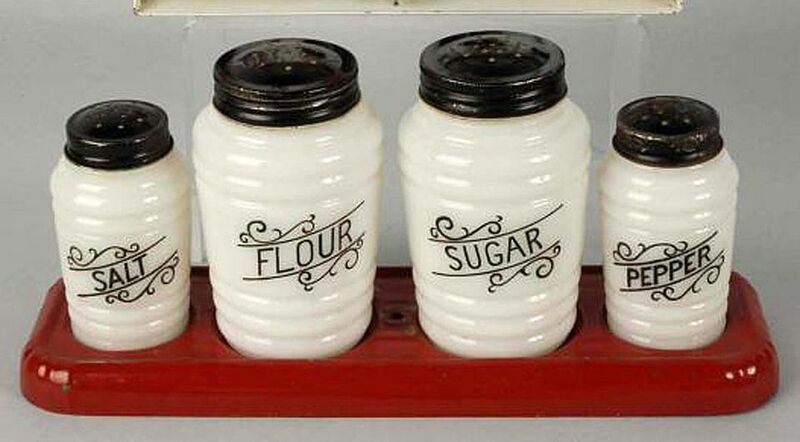 It was patented by Hazel Atlas Glass Co. in 1936, but used in kitchenware as early as the 1920s. Hazel Atlas company catalogs from 1929 reprinted in Colored Glassware of the Depression Era 2 by Hazel Marie Weatherman show refrigerator dishes, shaker sets (similar to those shown above), milk pitchers, mixing bowls, reamers, and other items made of this glass. When used in these chunkier kitchen items, the glass does more resemble milk glass made decades earlier in comparison to Hazel Atlas dinnerware. Many times Hazel Atlas dinnerware pieces are not marked, but Platonite kitchenware can be found with the raised HA logo on the bottoms of many items. Platonite should not be confused with milky glass made during the Depression era that collectors call "Clambroth." Because it does resemble actual clam broth in color, it is usually more translucent than Platonite. Platonite white glass was also used to produce several dinnerware lines, and in some instances when it was used for more delicate patterns it had a semi-opaque appearance. This is the case with the Ovide line made in the early 1930s. The most popular Ovide Platonite pieces today, although they are rarely found, are those with black Art Deco décor that contrasts wonderfully with the white glass. In 1938, a floral pattern of Platonite dinnerware called Forget-Me-Not appeared in Hazel Atlas catalogs as well. Dutch design mixing bowls and other kitchen utility items were also made during this period, along with a line of “Looney Tunes” children’s dishes (decorated with animal silhouettes). The formula changed over time so older Platonite (like the Ovide pattern) looks more translucent than the late-1930s wares. The most familiar and plentiful Platonite dishes were made in the Moderntone pattern. These are not considered to be Depression glass since they were made much later, but they are very familiar to collectors of Depression-era glassware. Some were produced in all white, but most have durable fired-on coloring on the front with the white glass showing on the back. 1938 – “Carnivalware” with fired-on solid orange blue yellow and green. 1938 – White with red, blue, yellow and green stripes (blue and red are sometimes referenced as “Deco” by collectors and may have a Japanese willow design in the center). 1939 – “Carnivalware” with fired-on solid red, blue, yellow, or green. 1940 – Pastel fired-on colors in pink, green, blue or yellow. 1940 – White with gold band. “Little Hostess Party Dishes” made by Hazel Atlas in the early 1950s were child-sized versions of the Moderntone pattern in boxed sets that came in the full range of fired-on colors. Most of the cardboard boxes these dishes were sold in were discarded long ago, but complete sets can sometimes be found together.